For precise control and monitoring of cabin temperature and humidity levels, Marine Air offers a number of modern, wall-mountable controls. From electromechanical to microprocessor platforms, Marine Air has the right control for your vessel. 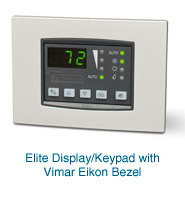 The Elite II control system represents the most intelligent and sophisticated control over cabin climates. The Elite II is available with an optional CAN-bus network adapter which connects to several popular helm and cabin touchscreen control systems. 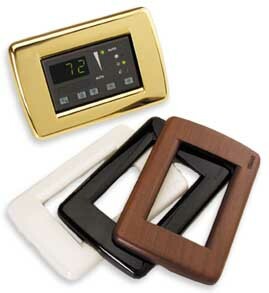 Complete the look of your cabin controls with a wide selection of stylish bezels, designed to compliment the decor. Easy to use with raised buttons and scroll button for mode selection. Cool-only, heat-only, dehumidify and automatic mode. Automatic humidity control reduces moisture when the boat is unattended. The easy to use Dometic MCS-DISPL with raised buttons and scroll button for mode selection. Cool-only, heat-only, dehumidify and automatic mode. Automatic humidity control reduces moisture when the boat is unattended. 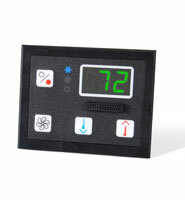 Dimensions product depth 6 "
Dimensions product height 4 "
Dimensions product width 8 "
The Elite™ Environmental Control Unit is a microprocessor-based controller designed for the precise monitoring of split and self-contained direct expansion air conditioning systems in marine environments. The control can also be used with chilled water air handlers and is called AH-Elite in that application. The Elite control has a sleek, modern Euro design, featuring raised buttons for easy access and control. Decorative snap-on Vimar® bezels are available in a variety of colors, styles, and materials to match your vessel's interior. The Elite display operates with the new Passport® I/O circuit board, which uses state-of-the-art SMT technology. Automatic humidity control – reduces moisture when the boat is unattended. Cool-only, heat-only, dehumidify, or automatic mode selection. Multiple fan-speed selections – automatic or three manual speeds. Optional CAN bus adapter for ship-wide climate control. Cycle pump with compressor or continuous pump operation. 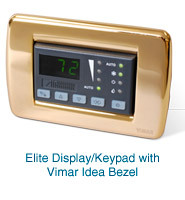 Available with popular Vimar bezels. Elite Retrofit Kits have everything necessary to upgrade existing Marine Air cabin control systems. Kits are available to replace MCP 3-knob, Passport II, ECU, and ECU-Maxx controls. 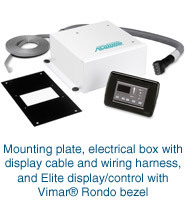 Available for direct expansion and chilled water air conditioning systems, each Elite Retrofit Kit contains everything necessary to upgrade existing control systems - including Elite display/keypad with Vimar Rondo bezel, electrical box with display cable and wiring harness, mounting plate, and alternate air sensor. The Elite display operates with the new Passport® I/O circuit board, which uses state-of-the-art SMT technology. The Elite display is flash programmable to enable future software upgrades without having to replace the circuit board. Blank the lit display when desired – keep cabin dark at night. "Pump Sentry" protects system if seawater pump fails. Heater relay allows optional electric heat. The Passport I/O Environmental Control is a microprocessor-based controller, designed for the precise monitoring of direct expansion and chilled water air conditioning systems in marine environments. The control is dual voltage, operating at both 115 and 230 Volts, 50/60 Hz. The display is available in both black and white. For chilled water air handlers, the control is called the AH-Passport I/O. Cool only, heat only, or automatic mode selection. Temperature displayed in Fahrenheit or Celsius. Multiple fan speed selections - automatic or six manual speeds. Cycle fan with compressor or continuous fan operation. Compressor time delay staging for multiple unit applications. Calibration of fan speed settings and temperature display to maintain precise control. Blank the lit display when desired. Controls shaded pole and split capacitor fan motors. Low voltage for optimum safety. Built-in air sensor (optional remote sensor). Marine Air Systems offers a variety of controls for its line of Direct Expansion (DX) and Chilled Water (CW) air conditioners. 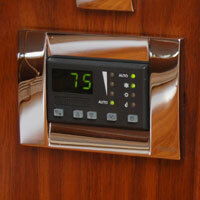 To learn more about adding digital controls to your boat's AC system, see PDF document L-0613B. The Elite has a sleek, modern Euro design and is a decorator's dream come true! The control snaps easily into decorative Vimar® bezels, which are available (separately) in dozens of colors and materials including wood, metal and thermoplastic. The Elite has all of the features and benefits of the old Passport® II, and more. The control works with the new Passport I/O circuit board, which utilizes state-of-the-art SMT technology. Programming the control is easy, thanks to the addition of one-touch key modes and scrolling buttons. This new control is "Flash Programmable", which allows for easy software upgrades in the future. It also features the new "Pump Sentry" seawater sensor option designed to better monitor pump operation. Elite Retrofit Kits are available for upgrading either Passport II or mechanically controlled units in the field. The Passport I/O display has the same look and feel as the old Passport II but with a few new features. Both the Passport I/O and Elite digital controls work with the new Passport I/O circuit board, which utilizes state-of-the-art SMT technology; the software logic is in the displays rather than on the circuit board. Features of the Passport I/O include: an electric heat relay so electric heat is now a convenient option with DX units; and a new programmable parameter allowing the seawater pump to be set for continuous operation, or to cycle with the compressor. The I/O circuit board has an additional air sensor connection, so the customer can now use the remote air sensor in the cabin and still monitor outside air temperature. Passport I/O Retrofit Kits are also available. Mechanical controls are also available for use with the DX product line and are a reliable low cost option. The controls come in either horizontal or vertical configurations. The 3-Knob control is sold with Central Systems, Vector Compacts and Cabin Mates, and the 2-Knob control is for use with the Cool Mate do-it-yourself kits. The Chilled Water Master Controller (CWMC) is our premiere chiller control. The CWMC is the brain that controls the individual Digital Diagnostic Controllers, (DDC), on a multi-staged chiller. It manages all cooling and heating functions for each chiller stage, as well as operation of the seawater and chilled water pumps. It optimizes compressor operation by automatically changing the lead compressor to evenly distribute run time. The CWMC monitors chiller operating status as well as all safety protection systems. DDCs can and do stand-alone as a single stage or multi-staged chiller controls. The addition of Pump Relay Panels (PRP) and remote DDC switches are necessary when not using the CWMC. The Tempered Water Logic Control (TWLC) is an advanced microprocessor chiller control specifically designed for marine circulated water systems. The TWLC system maximizes system performance, protects the chillers with advanced fault protection monitoring and shut-down routines, and has easy menu-driven operation supplying the user with important system information. System redundancy and easy field repair were the priorities when the TWLC was developed. Each chiller in a TWLC system has a dedicated power/logic board, and the boards are networked together to form an integrated system (automatically controlling up to 6 chillers). This design means that a single board or network failure will not shut down the entire system. The P/L board has board-mounted LEDs to help with troubleshooting, replaceable EPROM for software upgrades, and plug-in terminal strips and RJ-12 jacks which allow for quick field installation. The Elite and Passport I/O controls described above are also available for Chilled Water air handlers, and are designated by the "AH" at the beginning of the name. The AH-Elite is, by far, the choice of mega-yacht designers everywhere. Just like the Elite for DX Systems, the AH-Elite fits into Vimar type bezels used in most mega-yachts today, and are also available in a rainbow of colors. AH-Passport I/O and AH-Elite Retrofit Kits are available for upgrading either AH-Passport II or mechanically controlled units in the field. Mechanical controls are also available for use with the CW product line and are a reliable low cost option. The MCP-AH 3-Knob control may be used with any standard air handler, while the MCP-AH 2-Knob control is for use with "no-valve" air handlers only. Staged, Modular, and Compact Chillers (SCW, MCW, and CHC) have their own set of digital chiller controls. Tropical Marine Air Conditioning, Inc. services and sells marine equipment and Marine Air Parts- AquaAir, Technicold, and Cruisair air conditioning, refrigeration by U-Line, Spot Zero and Sea Xchange, ECOmar Sewage Treatment Systems, and ice machines Eskimo Ice. CONTACT US for your marine parts and equipment needs.